I’ve got two awesome recipes for you today! Just because I love you, and it’s the season of giving! As I’ve mentioned before, I have 4 kids. When you add up all the coaches, teachers, Sunday School leaders, music instructors (and I’m sure I’m leaving someone out) it adds up to a lot of people we want to thank and show our appreciation to over the holidays. So each year, I like to bake a special treat. My favorite teacher gift is popcorn. 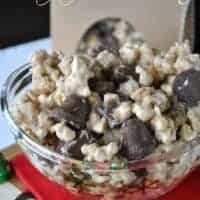 Not just any popcorn though…homemade chocolate covered caramel corn. Only this year, I’ve thrown a little twist into this tasty treat. I added some peanut butter to my melted white chocolate, creating a delicious peanut butter coating. I also threw in some Nestle Butterfinger Jingles (and some mini Butterfingers) to add to the Peanut Buttery goodness! This recipe makes a BIG batch, perfect for separating into gift bags, boxes or tins! The only addition I made to the recipe is I added some powdered sugar and sprinkles to make them a wee bit more festive! 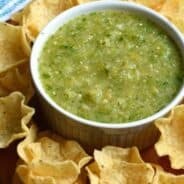 Head on over HERE to check out the recipe! 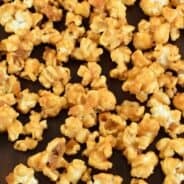 Pop 3 regular sized bags of microwave butter flavored popcorn. 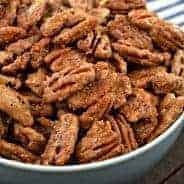 Remove all unpopped seeds. Place popped popcorn in a large bowl. Set aside. Line two broiler pans (or large disposable foil pans) with foil. Set aside. Preheat oven to 250 degrees. Melt butter in medium saucepan over high heat. Add in sugar, corn syrup and salt. Bring to a boil, stirring constantly. Boil one minute, remove from heat. Stir in baking soda and vanilla. Pour over popcorn. Mix well. Pour evenly into two pans. Bake for one hour, stirring every 15 minutes. Remove from oven and pour onto a large piece of parchment paper to cool. Break into pieces. Return to large bowl. Melt vanilla candy coating according to package directions. Whisk in peanut butter until creamy. Pour over popcorn. Mix gently until all popcorn has been coated. Add in Butterfingers. Pour onto parchment paper again to cool and set, about 30 minutes. Store in covered, air tight container. ENJOY. I can easily speak for my teacher father when I say he LOVES getting teacher gifts like this 🙂 too bad your kids don’t have him as a teacher haha. 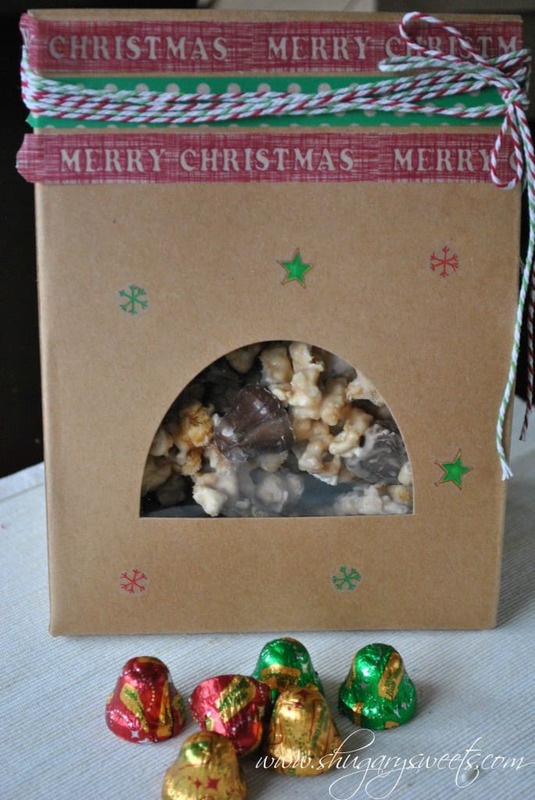 This popcorn is creative and looks SO delish–love the jingles + the butterfingers inside!! I love that we both made popcorn today Hayley!! 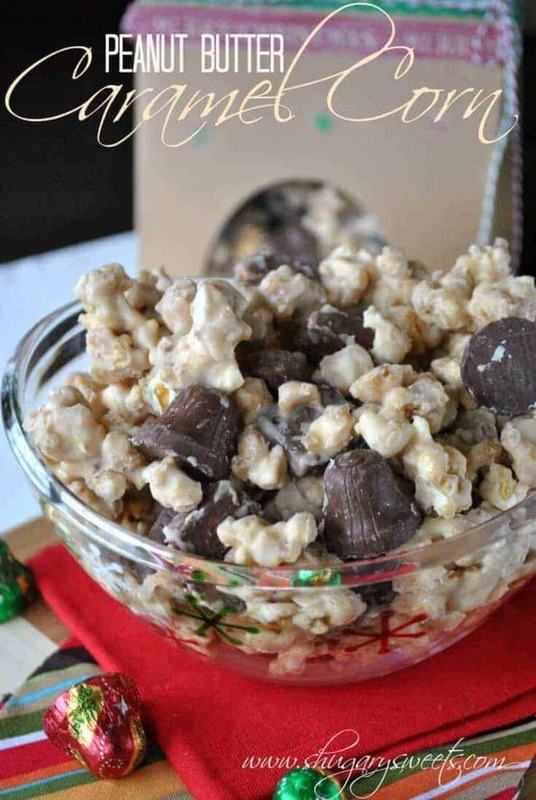 I love popcorn, caramel corn, basically this is totally me – and of course, love that you used PB with it! I have a recipe sort of like this from ages ago – I need to go read my old recipe and make yours or mine or something! Haha, I’ll have to check out that older recipe of yours! Love this! Caramel corn always makes me happy. I too love popcorn, even more with chocolate and peanut butter on it! 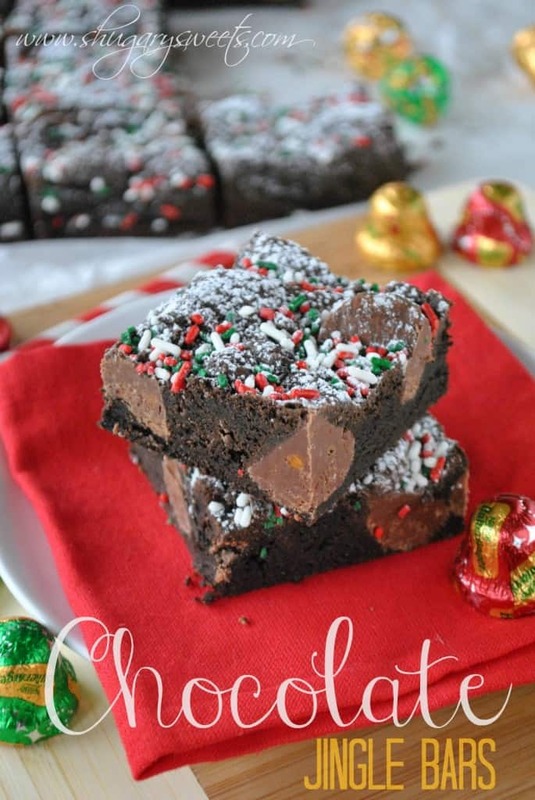 Love the Jingle Bars too….they look so moist and chocolatey! I love this! Popcorn is such a great idea. I think I need to get on this bandwagon..
You are taking over the internet. I love it. I am? I had no idea!! I love those Holiday bells, every single one, the butterfingers, the reese’s. Just something about putting them into a holiday shape makes them better. A great teacher gift! These look great!! And, OMG, I’m ALWAYS so nervous that I’m forgetting someone for Christmas thank you treats! This year seems to be Emma’s todder “coming of age” year, and all of a sudden I have preschool teachers and directors, and Nursery leaders, and speech therapists that I have to remember now too! Ahhh! So glad you got to enjoy some!!! Oh my goodness – this looks dangerous! I don’t think I’ll ever be able to stop eating these! Mmmm lucky teachers! This caramel corn looks sooooooo gooooood! I love how you added a layer of peanut butter! This would be devoured in no time at my house! These look amazing! I am going to try the popcorn!